You may not know, however, that the first instance of online crowdfunding dates way back to 1997, when fans underwrote an entire U.S. tour for the British rock group Marillion — raising $60,000 in donations via a fan-based Internet campaign. Even I developed our first product by selling something that didn’t yet exist in 2007 — going from zero to 6 figures in a week — almost two years before Kickstarter was founded. Both are examples of how having an existing audience is the key ingredient for getting people to invest in your ideas. Now we do have Kickstarter, Indiegogo, GoFundMe, and scores of niche crowdfunding platforms. This leads people to make the mistake that these platforms provide the audience, and entrepreneurs just bring that great idea. Nope, same as it ever was — your existing audience is still crucial to amplify the benefits of a crowdfunding platform, and your audience must be developed first. Today we’re chatting with Khierstyn Ross, who helps entrepreneurs start early putting into place the necessary ingredients for a successful crowdfunding campaign, and she happily shares her expertise with the Unemployable audience. Khierstyn Ross: Hi, this is Khierstyn Ross, and I’m unemployable. I’m also a crowdfunding advisor that helps startups launch products on Kickstarter and Indiegogo. Brian Clark: Hello and welcome. 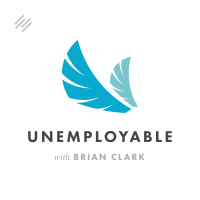 I am Brian Clark, founder and CEO of Rainmaker Digital and the host of Unemployable. Today we’re talking crowdfunding. It’s a great episode. I think you’ll learn a lot. Before we get into it, if you’re over at iTunes listening to this, can you take a second to leave a rating or a review? You can actually had over there with this easy link even if you aren’t in iTunes at the moment. It’s Unemployable.com/iTunes. And just tell me your thoughts on season three so far. What are you liking? What would you like to see in the future? I’d really appreciate it. I’ve got about 87 ratings and reviews over there at the moment, which is fantastic. Very happy for the support. I’ve been told I need to get over 100 for a young show like this to be credible. I don’t know if that’s true or not, but it sounds like a good number to shoot for. We can get over that 100 mark. That’s only 13 people doing me a solid. I appreciate it, and I certainly appreciate the feedback no matter what it is — good, bad, indifferent. All right, so crowdfunding. You likely know what it is. It’s a way to raise money for a project or venture by pulling contributions from a large number of people, usually online. In 2015 alone, crowdfunding generated an estimated $34 billion worldwide. You may not know, however, that the first instance of online crowdfunding dates way back to 1997 when fans underwrote an entire US tour for the British rock group Marillion — raising $60,000 in donations by a fan-based Internet campaign. Even I developed our first product by selling something that didn’t yet exist in 2007 — going from zero to six figures in a week — and this was almost two years before Kickstarter was founded. Both are examples of how having an existing audience is the key ingredient for getting people to invest in your ideas. Now, we do have Kickstarter, Indiegogo, GoFundMe — scores of niche crowdfunding platforms. This leads people to make the mistake that these platforms provide the audience, and entrepreneurs just bring that great idea. Nope, same as it ever was. Your existing audience is still crucial to amplify the benefits of a crowdfunding platform, and your audience must be developed ahead of time. Today we’re chatting with Khierstyn Ross, who helps entrepreneurs start early, putting into place the necessary ingredients for a successful crowdfunding campaign, and she happily shares her expertise with the Unemployable audience. Khierstyn, thank you so much for joining us. Khierstyn Ross: Hey, thanks for having me. This is great. Brian Clark: Yeah, absolutely. I know this episode is actually going to be airing later, but hopefully by the time that happens, I will have seen you twice. Khierstyn Ross: I hope so because we’re catching up in Denver pretty soon. Brian Clark: Right, but are you going to the wedding in Reno? Brian Clark: Oh, you’re not, okay. For some reason I thought you were. That’s Nicole. Nicole is going, your partner in crime. Khierstyn Ross: Yes. I wish. I need to be super focused for the next couple of weeks because I’m going to be in the States for a month. Before that I have a lot of stuff I need to be getting off my plate. Brian Clark: Ah, well, Denver’s good enough. We are going to have fun there. Khierstyn Ross: I cannot wait. Brian Clark: Excellent, so crowdfunding. We’re going to talk about it in several aspects — at the product level and now even at the company investment fundraising level — but first of all, I want to explore a little bit about how you got to this point, how you got into crowdfunding advising and all that good stuff. Give us a brief entrepreneurial journey for you. Khierstyn Ross: Okay, let’s go brief because I’ve been in the entrepreneurial space for about 10 years. Very, very, very short in university, I was recruited to run a student painting franchise, so I was in charge of an area where I had to find houses for my painters to paint. I did that for three years and ended up being one of the top five percent in Canada. When I graduated with no other plans, they recruited me to be an advisor with that company. That’s how I got into advising startups. Eventually, I wanted to break out and create a name for myself as opposed to being connected to a company. While traveling, whatever, I was learning how to run a business online, and I was working freelance with different startups doing various things. It wasn’t really until I moved back to Toronto … at the time I was living in London. I moved back to Toronto, and I got involved with a local startup who, at the time, had this great idea for a wearable tech vest that helps you lose weight through cold temperatures. He wanted to launch a Kickstarter campaign, and at the time, this was about a year and a half now, I’m like, “I don’t even know what crowdfunding is, but sure, I know a bit about online marketing. Let’s do this.” That first campaign we ended up making all the wrong assumptions. But when people in the startup space locally, they find out about that transition that you’ve made, Kickstarter being such a hot topic right now, you get a lot of companies coming to you and saying, “How did you do that $600,000? Can you do that with my company?” I ended up taking on a couple other projects in the next six months, and both of them did over $300,000 in raise on Indiegogo. After that point, I realized, “Wow, this is really something I could latch onto,” and I really love working with startups. That’s always going to be my thing, and I love helping them create beautiful products and bringing them to market as well. It was from a few big successes that I decided to niche into crowdfunding, and here we are now. Brian Clark: At this point, probably most of the audience knows what crowdfunding is, but just in case because earlier you were like, “I don’t even know what this is,” define crowdfunding for us. Khierstyn Ross: There are two kinds of crowdfunding, which we’re going to be talking about both today, but the one kind that I was talking about is rewards-based crowdfunding, where the top two platforms are Kickstarter and Indiegogo. Crowdfunding is a way for startup founders to take a product and launch a marketing campaign that goes from zero to 60 days that is hosted on, say, Kickstarter, for the go-to. What the whole purpose of that is it’s a fundraising campaign for them to raise funds to make enough money to hit their goal to manufacture a product, to develop prototype, or whatever the goal of the campaign is. It’s an alternate route of funding that leads to you leaving the campaign actually having customers. I can’t technically call it pre-ordering, but that’s essentially what people are doing. As a consumer, you’re giving money to a project and getting the product in return if it’s a physical product. That’s what crowdfunding is in the rewards-based sense. Do you want me to get into equity just yet? Brian Clark: Yeah, just real quick because we are going to touch on that toward the end. Khierstyn Ross: Cool. Equity is a lot different. Where the consumer is pre-ordering a product with the first one, the second one is you’re actually looking for investment for your campaign. You are going to have people that can buy in as private or licensed investors to get shares in your company, so you’re looking at, with equity raising, a lot more money. What you get in exchange is more shares, say, in the company itself as opposed to just getting a cool product. Brian Clark: Right. Okay, so that sounds pretty interesting, and I was lucky enough to be on your podcast a little while back. Khierstyn Ross: I know. It was fun. Brian Clark: And we talked about how we launched our very first product nine years ago this month. I can’t believe it’s been that long. This was before Kickstarter and Indiegogo, but basically I sold something that didn’t exist. It was the same concept because we were selling a course. Then the course started, and we had to deliver on it over the next year. We were able to do that because Copyblogger had an existing audience. So conceptually, it’s the same thing, but there was no crowdfunding platform involved. In fact, I didn’t even know of such a thing, but it just made sense. I needed to get paid to create this product, for a lot of reasons. Number one, I made a better product by doing it with feedback and all that good stuff like we talked about, but that was our first product. We needed to be in business. We were able to go from zero to six figures in a week, and we were off to the races. Everywhere I look in my brief examination of crowdfunding success stories, case studies, all that kind of stuff, they always say start building an audience beforehand — and yet I think people have the misconception that the platform Kickstarter or Indiegogo is the audience. So his situation was he had launched a video or launched a campaign about four days before he contacted me. His goal was $100,000 raise. When I looked at his campaign four days after launch, he had raised four percent of his goal. We’re texting back and forth at 11:30 at night, and I asked him, “Can I ask you what your budget is for marketing?” He said, “I want to spend $5,000 on efforts to bring people to my page.” I was like, “Okay. Please don’t spend any money on marketing until we talk.” I jumped on the phone with him because he’s made the misconception that a lot of failed campaigns do, which is, “Well, Kickstarter and Indiegogo have this community of people, so all I have to do is launch my campaign.” That is actually the worst thing you can do. Have you ever heard of the popularity algorithm with Kickstarter? Brian Clark: No, I haven’t. Let’s talk about that. Khierstyn Ross: Yeah. Looking at the business model of Indiegogo, Kickstarter, or any marketplace, even Amazon or iTunes, they make commission off of every dollar raised on their platform. It makes sense for them that they’re going to make more money when they boost the campaigns that are popular or making the most money. Whenever you go onto Kickstarter and you’re browsing the Discover section, the trending, top of category, or anything like that, you’re going to find some pretty popular, successful campaigns. But what you don’t see are all the other campaigns that have not raised very much money, so the trick is, how do you get to that front page? Or how do you get to top of category? That’s where having an audience comes in. Popularity algorithm will say that, as soon as you launch, “If I see a campaign that is moving quickly, raising a lot of money, getting a lot of traffic, and getting a lot of transactions and comments, then this must be something really hot and special, and we need to boost this on the platform.” But if you don’t have an audience, you can’t create those early sales and that really momentum that you need to jumpstart your campaign in order for the Kickstarter community to actually start to see it and getting more traffic. The misconception that, yes, Kickstarter has an audience and that’s why there are so many successful campaigns, but what you are not seeing is how they got there. You need to raise about, I would say, 30 to 40 percent of your goal in the first three days to have a shot of taking advantage of the rest of the Kickstarter crowd. Brian Clark: Okay. Now, make the case to me, if I have an existing audience, why would I use Kickstarter? Khierstyn Ross: That’s a great question. John Lee Dumas did The Freedom Journal. John Lee Dumas, for those listening that don’t know him, he’s a top podcaster. He makes over a million dollars a year and has a very great following online. Same thing with you, Brian. Now why would you use Kickstarter? The reason I would say that it makes sense for them is if you’re looking for a new audience to bring your offer in front of. That would be, in my opinion, the only time it makes sense for you to do it. While your audience might help raise, say, $100K, if it’s something that the masses can benefit from, then you’re going to amplify that on Kickstarter or Indiegogo because it’s a much larger crowd or audience than you may necessarily have. Brian Clark: Yeah, I get it, especially when you explain the popularity algorithm. You use your existing audience to get momentum. It’s kind of like anything. You do well on Google because you’re already popular with people. You do well on iTunes because you already have a bunch of subscribers — which you get more exposure, you get more subscribers. It’s like the rich get richer. Khierstyn Ross: Yeah, exactly, but you don’t see where people start. That’s where you really do have to spend that time building your audience. Unless if you’re the unicorn that doesn’t need it, but generally you really do because you can really screw up your campaign if you don’t pay attention to that. Not to mention, there are so many other benefits of building an audience, like communicating with your audience and making sure you really understand your customers, so you can frame your offer properly. Brian Clark: If people are out there right now and they don’t have an existing audience — and of course, I tell them in every context, please do that — but I was reading a case study of a successful crowdfunding campaign. They started building an audience specifically for this thing that they were building the year before, so there’s a lot of preplanning. Do you find that people come to you that far in advance, or do you mostly get the people who are like, “Help, I just tanked live”? Even the worst thing, too, going back that story, I told him not to spend $5,000 because, even if he sends cold traffic or any paid ads to that site now where people only see it’s four percent funded, it’s not very popular, which means it’s not going to convert. If anyone understands crowdfunding that is looking at that page, they know the campaign is going to fail. You’re just going to be spending money, and it won’t convert. You’re just wasting it. So in that case, most times, I will tell people that they need to just give up on their campaign, relaunch, and do things differently the next time. Brian Clark: Right. Okay, so when someone comes to you ahead of time, like a smart person does, what’s your strategy? Are you effectively initiating a content marketing strategy to build an email list relevant to the ultimate product that’s going to be crowdfunded? Khierstyn Ross: Yep. Okay, so there’s one project I’m on right now, and I’ve been working with Chris for about four months now, so four or five months. I technically don’t come into the campaign until about two or three months before, but I give some pointers if people come to me in advance. With Chris, what we’re doing is he’s releasing a physical product, and it’s an accessory for an electric guitar. What we wanted to do was build an audience, but he was in that situation where he didn’t have a physical prototype to show people. We put a box with question marks over it and created a teaser video for the campaign. What we are doing with that is we’re doing video marketing with it. Even though we aren’t spending too much money on Facebook Ads until we are about two weeks away from lunch, what we’re doing is we are testing different video content to see who interacts with it. What we’re doing at the end of the video is a call to action to join our email list. Content is great. The thing with crowdfunding is, if you want to get on podcasts, it’s a little bit harder unless if you have something that becomes successful. That’s more of an after-you-launch thing. My strategy is content marketing, and you can do that through influencers. Or even better, if you have money for a Facebook Ad spend, then you’re going to be driving traffic to a landing page, which has an offer offering early-bird rewards when you sign up and you pledge that first day. It’s kind of like a Black Friday event where, when you launch that very first day, people who help you day one get 40, 50, or 60 percent off your product. If you know ahead of time that you’re offering discounts to those early people, then you want to offer that as bait to join your email list as well. Brian Clark: Got it, yeah. Khierstyn Ross: You need to know what your strategy is, but any Internet marketer or anyone who knows how to do emails and broadcasts and all that, they will know that. I’m not going to keep repeating myself, but there’s that. Facebook Ads don’t work, and if you don’t have any money to spend, then it would be really great for you to go out to events. If you have a product, why don’t you enter some startup competitions and just start to try to get free press around what you’re doing? Brian Clark: The thing that’s interesting to me, beyond people thinking that the crowdfunding platform is the audience, is that the crowdfunding campaign is the only viability that’s put into the product. If people like it, then it will work. If they don’t, it won’t. Do you advise people to do a little more rigorous market research up front? Khierstyn Ross: I do. Just from what I’ve seen from campaigns it’s a very good chance that, if you spend no money and you just throw up your campaign with no audience, you will fail, which is not anything negative to say about your product. With Thin Ice, that first campaign I was on, we basically did that and then relaunched and had success, so it wasn’t the product. I think that one of the reasons you want to start so far out is because you want to be starting to figure out who your customer is and having those conversations. I think you’re going to find out really quickly if this is something people are not interested in, and you need to change your offer based on the conversations you’re having. Brian Clark: Got you, so it’s just like what we do, again, with our own audience. We identify a problem or a need, and then we start building something. It’s usually at a minimum viable state at launch. So far, nothing’s ever flopped, thank god. But we’ve been serving the same audience for a decade, and you really get in tune with people. I just worry sometimes when people are going into … they got the idea, and it’s in a vacuum. It’s just in their head, and they have no idea if anyone wants this thing. I can see people being disappointed. It makes sense, what you’re saying, in the sense that, if you’re pre-building an audience before you actually launch on the platform and you’re hearing crickets, then you know something right there. Khierstyn Ross: Yeah, and the other thing that a lot of people don’t see is how much money goes into these launches. Half the people I talk to will never talk to a single customer. That’s just the reality. It’s too much work, but then I find that the barrier to entry is a lot higher. When they come to me and say, “Well, how much money do I need to spend to launch my campaign through building an audience, getting my video together?” I’ll always say it’s between, depending on your goal, it’s conservatively $10,000. I know that, for me, before I put $10,000 into something, I need to make sure it’s going to sell, so that’s my motivation for speaking to people. But I’ll find that people who aren’t willing to put in the elbow grease to make sure this is something they want or even change the offer, they’re not going to be successful without a lot of heartache, you know? Brian Clark: Yeah. Okay, so the pre-work is done. You launch on the platform of your choice. Let’s say it’s Kickstarter. At that point, what is Khierstyn’s job in making sure that this thing hits its funding goal? Khierstyn Ross: My job first is to make sure that people are ready to buy on that first day. That’s how we put together the reward packages and frame the communication with customer emails and whatever. But just say we launch, we’ve done all that properly, and we’re starting to get early sales. Those first three to four days after launch, first off, we are pitching press. We’re talking to influencers. We’re pitching, basically, a week before your project and up until one or two weeks into it, and continued your pitching is what you’re doing. Well, I help with that, too, but what I’m also doing is I’m looking for on-site conversions. What that means is, when you look at the analytics in the backend of your campaign, you’ll see how many people are coming to your page, but you’re also going to see how many transactions you’re getting. If that is less than, say, one or two percent, then there’s something wrong with your page. There’s messaging that isn’t really being conveyed properly, so I’m looking for that and seeing if there’s any way we can optimize it based on the questions that we’re getting. That’s one thing that we do. I will help satellite the campaign for zero to 30 days, or whatever. I’m always looking for reasons to keep communicating with the audience, keep press engaged, getting traffic to the page, all that stuff. I don’t do everything. But when I’m on a campaign, I do bring in freelancers to help offset the social and Facebook Ads, so I’m making sure that everything is moving forward with it. Brian Clark: When we did our version of this nine years ago, I found it highly motivating to show up to work after all these people paid me for something that didn’t exist yet, and yet I’ve heard stories of people who do a successful raise, and they don’t deliver. Have you been involved in a situation like that? Khierstyn Ross: I’ve been in situations where the campaigns are late to deliver. So personally involved in a campaign that has not delivered, no, but I follow the news like a lot of other people and see that, that happens frequently. Brian Clark: Yeah, I don’t get that. Why would you go through all of this and succeed and then fail to deliver? Everyone’s different, I guess. Khierstyn Ross: I can tell you what my opinion might be, and I’m speaking mostly for hardware products or anything where there’s a lot of engineering that goes into it. A lot of hardware startups do not estimate how much money they need properly when they launch a crowdfunding campaign. So even if you raise $500,000, if you don’t account for what things could go wrong, you can end up completely over budget. It’s not the first time that I’ve seen that hardware startups need to go for additional funding rounds to be able to deliver product. I don’t know why people won’t deliver. It could definitely be related to, “Well, I just can’t find $300K to finish this,” or they just want to party. On the flip side, late delivery is definitely caused by various factors, but the ones that are most prominent is they just run out of money. They underestimate things. Problems come up in the development. Manufacturers back out. A lot of these problems are caused from inexperienced creators. They’ll raise a bunch of money, and then they’ll say, “Great. Now let’s go find fulfillment and manufacturing,” and then realize all these problems crop up that they didn’t anticipate in the beginning. Brian Clark: Yeah. Really it, again, goes back to what you do before. Everyone wants to rush into it, and yet if you don’t do the audience, you don’t do the pre-planning, and you don’t adequately estimate how much it’s going to take to get it done, you find yourself in trouble in a whole different way. Khierstyn Ross: Exactly. I work with a couple of hardware startups right now. Post-crowdfunding, they’re still looking for funding all the time. One thing that I find interesting is the more you raise, these aren’t sales. It’s not revenue. It’s debt. Once you take all this money, you’re going to spend a bunch of money on PR and development, but then, what happens six months down the road when you have to buy inventory to deliver that? If you didn’t properly estimate your costs, you’re now potentially out $200,000 because you need to buy inventory to actually ship this in six or nine months. Brian Clark: I think some people just look at, “Oh, crowdfunding. What a miracle,” and no, it’s work, just like everything else that we do. It’s just a strategic approach that has worked for many people. Some people are not cut out for it. Others are not resourceful enough. Others just have founder blindness with thinking their product is amazing, but they’re not willing to go out and talk to people about it. There’s a rare breed of people that should be crowdfunding. If not, it’s just going to be a nice wake-up call. Brian Clark: Let’s talk a little bit about equity crowdfunding. This has been around for several years, but that thing that changed in May of 2016 this year was you can now crowd fund from the general population. They do not have to be accredited investors. That’s a big deal because that really opens you up to everyone. Now, there are a lot of rules and restrictions. I know you and I chatted about this offline, and you were just getting into it. Tell us a little bit about what you’ve learned about equity crowdfunding. Khierstyn Ross: Yeah, so a bit about what I’ve learned, I haven’t personally worked on any equity campaigns, although I am looking into that in the future. One question I’ll get asked is, “Okay, well, if I’m crowdfunding, which one should I do first?” I always think that you should do a rewards-based campaign on Kickstarter before you go looking for investment. The reason for that is, again, if you have a physical product, you want to prove that there’s a need for it. You want to get some skin in the game, and you want to develop a great product by the time you bring that to investors. I feel like equity could be a really great option for the campaigns that won’t do well on Kickstarter — so what if you have a B2B solution? What if you have an app that has great potential? Those could be something where, if you’re looking for more investment, that would make more sense for you because you’re customer that you’re going after is more of a B2B type. Those campaigns don’t tend to do too well on Kickstarter, so that’s one thing to be aware of. I’m still really hesitant to recommend anyone do equity crowdfunding because the laws are still being created as we speak because it’s a brand-new industry. I would highly suggest that you get legal advice from which state it makes sense to, or even which province if you’re in Canada, but makes sense to do equity because the laws are completely different for how much accredited investors can invest in your campaign versus people like you and I that just want to invest. And make sure you really understand what giving up a huge chunk of your company is going to do, and make sure that that’s the long-term play that you want. Brian Clark: Yeah. I actually looked into it after you and I chatted about it because it is restrictive. What I found is, if you’re trying to raise below a hundred grand, it’s relatively painless. As soon as you go over a hundred grand, you have to have audited financial statements. If anyone out there knows how much that costs, it’s pretty expensive. I think people are probably most often, for larger amounts of money, better off just sticking with angels and early-stage VC. Khierstyn Ross: I have had a client do equity crowdfunding, and this is about six months before I worked with them. What they didn’t like about it, just from a startup standpoint, was they have to put all of their financial projections online for the world to see, and their whole business plan and what they’re going to do with the money. I think that’s scary to think that you’re putting your entire plans for your business online because your competition can see that, and if you are trying to take a strategic approach to a new market, you may not want people knowing that much about it. That’s where it could be really good having the private talks with investors like angels and VCs because it’s not available to the world. Brian Clark: Yeah, it’s interesting, and you still, of course, have the audience issue. If you’ve got an audience, you ought to crowdfund the product, right? Brian Clark: Like you said, that makes a lot more sense. You don’t have people owning part of your company. It’s not legally pre-sales. But in a way you’re pre-selling the idea of it, and if people are into it, then that is an important market viability test. I was actually listening to, I think it was ESPN radio or something — believe it or not my wife listens to ESPN radio. I hate it. Brian Clark: Yeah, there was an ad for an equity fundraising campaign. Basically, they’re trying to raise money through equity crowdfunding taking out, I would guess, expensive radio ads. All it made me wonder was, if this is such a good idea, why are you going this route? Khierstyn Ross: Yeah, and not to mention the paperwork involved in that, right? Brian Clark: Yeah. It’s immense. Khierstyn Ross: It’s not something I would, the legal side, I would never, ever advise on. I’m not a lawyer. You are, but I think it makes sense in certain points. I would recommend more to people that have had a successful raise, and they have a bit of a business to then look to scale with equity-based crowdfunding. I wouldn’t necessarily start out with that because you don’t know what valuation is, you don’t know much about how your consumers are going to relate to your product, and all that stuff. I think that, as a founder, you want to figure out what your baby is going to look like first before you send it off to a certain preschool, you know? Brian Clark: Yeah. I agree. I thought the concept of small raises, like $20,000 to $99,000 for the solopreneur, just small amounts of cash to get going or get a little growth strategy going, that would be interesting. But I notice that no one is going after that market because think of the transaction volume you’d have to have as a platform to make any money. They’re only taking five percent of the raise, I think, is some of the commissions I saw. Yeah. It’s interesting. We’ll see how it develops, but it’s very young. It just really opened up this year, and right now, they have so many restrictions in place. I understand why because they want to see what happens. They don’t want to see grandma getting taken by someone with their slick sales pitch that turns out to be a scam. Khierstyn Ross: I know. I think what we’re seeing with crowdfunding as a whole right now is how early entrepreneurs are, how inexperienced they are, and what kind of problems that could cause. It’s really also cool to think of what Kickstarter and Indiegogo are going to be doing in the future to deal with this. If a campaign doesn’t talk to its backers, if it doesn’t deliver value, if it runs away with people’s money, it hurts the entire ecosystem, so I’m so curious to see how it’s going to be handling the problems associated with the campaigns. I think equity, too, is a newer thing. I can’t imagine that campaign failing, and you not being able to refund someone’s $2,500 investment. We don’t know what the problems with that are going to be just yet. Brian Clark: Yeah, so you’re working with clients, obviously. What else have you got going on in the crowdfunding space? Khierstyn Ross: Crowdfunding is my full-time thing. I do that, and I’m also in the process of developing a digital course for crowdfunding. That’s to cater to people who are looking at raising less than a quarter million, and they’re more the do-it-yourself type. That’s what I’m going to be releasing around the date of this podcast, actually. Brian Clark: You should crowdfund your crowdfunding course. Brian Clark: Just to be super meta. Khierstyn Ross: Oh, man. You know, that terrifies me. Brian Clark: Your whole reputation is on the line right there in front of everyone. Khierstyn Ross: Jordan Harbinger, I think it was him, he sent a link around on Facebook to say, “Isn’t this ironic?” and you look at it. It’s a Kickstarter campaign, a guy claiming to be a crowdfunding advisor, and he’s written a book about it — and it failed. Brian Clark: Wow. That’s going to leave a mark. Khierstyn Ross: Yeah, I’m just like, for me, I would rather do it the old-school way of building a specific audience. I’m doing that through content and getting people on my email list who are specifically looking for education around crowdfunding. I’m just so terrified, like, “Oh my god, my whole reputation goes on this one campaign that I could put up, and it could fail.” Oh, man. Khierstyn Ross: No pressure. I’m great with other companies. It’s just I’m so concerned with that. I know when I launch, it will be a success. I’ve already launched this before, reviews have been great, and I booked up. Yeah. I don’t know, but that would be so meta. It just terrifies me. Brian Clark: I was just kidding, don’t worry. Khierstyn Ross: No, but I get that question a lot. Brian Clark: Yeah. Where can people find you? Khierstyn Ross: If you want to find some crowdfunding resources, or I just created the Crowdfunding Product Launch Checklist you could download on my website, it’s CrowdfundingUncut.com. Brian Clark: We will put that in the show notes. We’ll find you on Twitter and all that good stuff. Thank you so much for the time. This was interesting to me because I honestly don’t know all that much about it despite our own little mini version of it nine years ago. But you know me — audience is everything. It’s the magic thing. It makes all of the other things happen. Khierstyn Ross: It makes it so easy. You release a product, people buy, and you don’t have to do a big advertising campaign. Brian Clark: Absolutely. All right, everyone. Thanks for tuning in, and as always, keep going.